This listing is for ONE (1) baby announcement. As your recipient opens the box it will read "You're going to be (chosen role)!" with a special shiny penny. This little cutie is tucked inside a kraft box cushioned and tied off with a satin ribbon. If you would like a custom message or would like to add a due date, just leave the information in the Note to Seller box at the time you check out. ➤ Do you need this processed a bit quicker? Add Rush Service https://www.etsy.com/listing/170128077/rush-my-order-production?ref=shop_home_active_1&ga_search_query=rush to push your order up the line and out the door within 1-2 days. ➤ Contact me at http://www.etsy.com/convo_new.php?to_username=petite25 if you have any questions or concerns. ➤ I would be happy to ship these directly to your recipients. Just change the "Ship to" address each time you check out to reflect the recipient. ➤ Custom orders are non-refundable! © Petite25 Studios All words, pictures and artwork are copyright protected and may not be duplicated in any way shape or form without written consent. My sister and brother and law were ecstatic! Wonderful! Right on time. Thankful for such a sweet way to share news. LOVED it! And so did our family. It was right on time. In less than a week, it arrived in Georgia from Philadelphia. 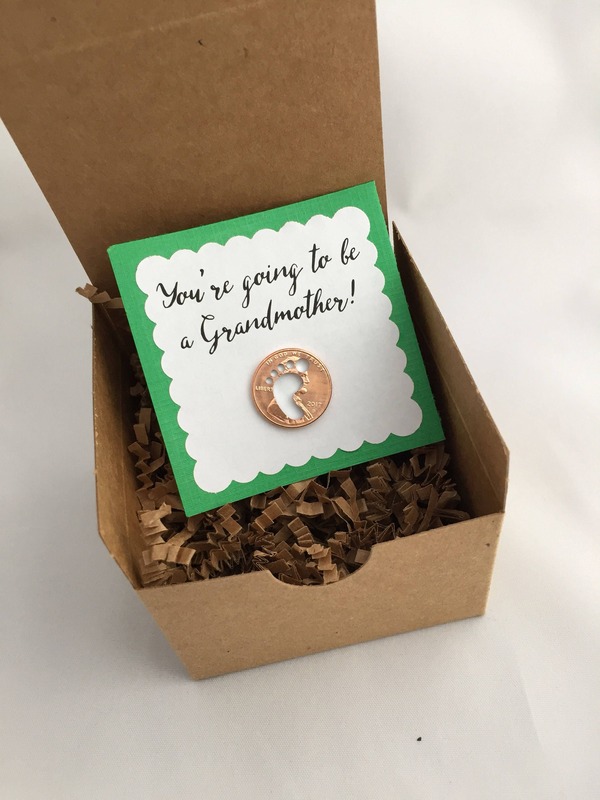 Gift was perfect for a cute announcement for the coin enthusiast in my life. Order came on time, looked great and presentation was great as well!!! We currently accept all major credit cards, Paypal and Etsy gift cards. We kindly request payment immediately upon purchase. Transactions will be canceled after three days of non-payment. Should you have any problems with the payment process, please contact Petite25 Studios. We reserve the right to refuse a transaction for ANY reason. If a return is taking place, the buyer is responsible for shipping costs both ways. we will not refund the shipping-to-you cost. Items must be received within 14 business days and in perfect condition before a refund is issued. You will be refunded the purchase price minus etsy and paypal fees. Requests for returns must be made within 4 days after the item is delivered to you! Custom orders are NOT refundable once the order has begun or has been completed. Due to the personalized, made-to-order nature of custom work, we simply cannot accept these items back. If the item sent to you is incorrect, that's a different story. Please contact Petite25 Studios if such a situation occurs. Customers are responsible to provide an address that can/will accept a package in the "ship to" address at the time of check out. If there are any issues with delivery (address is incorrect, post office has difficult time locating an address, etc) we are NOT responsible for an item being lost, stuck at the local post office, or returned to us. If an item is returned and you would like it resent, we do not cover postage. It is the customers' responsibility to cover the additional postage on any item that is reshipped. If you would like the package shipped to your recipient, you MUST input their address in the "ship to" address at the time you check out. We will not take a request to ship an item to a different address other than the one specified in the "ship to" address of your order. Please DO NOT make any requests in the Notes section as they will not be accepted. Insurance is strongly recommended. For orders $100+ insurance is automatically included. Please convo us if you wish to purchase insurance on any item and we will send you a revised invoice. we do not assume responsibility for items lost or damaged by the carrier, but will work to resolve any mailing difficulties within our means. Are shipped First Class and "typically" take 3-5 business days but can take up to 2 weeks and is not guaranteed. You can always upgrade your shipping to Priority (2-3 business days- not guaranteed) or Express (1-2 business days- guaranteed). The USPS is doing their best to get things where they need to go so let's trust them to get it done! If an order within the USA goes off the radar, and 20 days have passed with no delivery or status update, we will do our best to assist you in contacting the USPS. But please keep in mind that if insurance is not purchased (an additional cost on your part) a claim cannot be filed with the USPS. Domestic insurance is minimal (starting at $0.40) and is highly recommended. We are not responsible for packages lost by the USPS. Once the item is in the hands of the USPS, we have no control over how it is handled and CANNOT guarantee its delivery. If an item has been delayed in arrival, please let us know! No refunds or replacements will be made until six weeks of non-delivery from date of shipment has passed. This is because it can take up to six weeks for international orders to arrive at their destination due to customs and other such hoopla. And it might end up getting there safe and sound! INTERNATIONAL BUYERS: It is important that YOU understand YOUR country's import regulations before ordering anything made from grapevine, bark, moss, wood or other plant material. We always state on the customs form that these are: "craft supplies, wood slice with bark". Should the item be denied by your country's Customs, there will be no refund given. ▶︎▶︎▶︎United Kingdom--- please be aware the U.K. imposes a customs fee (minimum £8) on all incoming packages and is based on the value of the merchandise stated on your shipping label. Should an item, either domestic or international, arrive damaged, please contact us within 24 hours of delivery! We will ask you to send a photo and describe the condition of the item of the packaging so we can be better prepared in the future. If an item is being shipped directly to a friend or loved one, please let us know (in the Note to Seller box at the time you check out) so the invoice is not included in the package! NON-SMOKING - all my items are made in my non-smoking studio. I do have a cat though every effort is made to keep her away from my work. If you are extremely allergic, please act accordingly. I am always happy to discuss custom orders! It is always exciting to create something new that is not available within my shop. So feel free to convo me with any questions and or requests.